Want to know how your email packets from Dallas make it over to the Nigerian banker that wants to share his wealth with you? Or what about your VoIP call from Houston to Honolulu? Now there’s a map for that, thanks to the folks at Telegeography who have rolled out an interactive tool that shows you the location of various undersea cables. 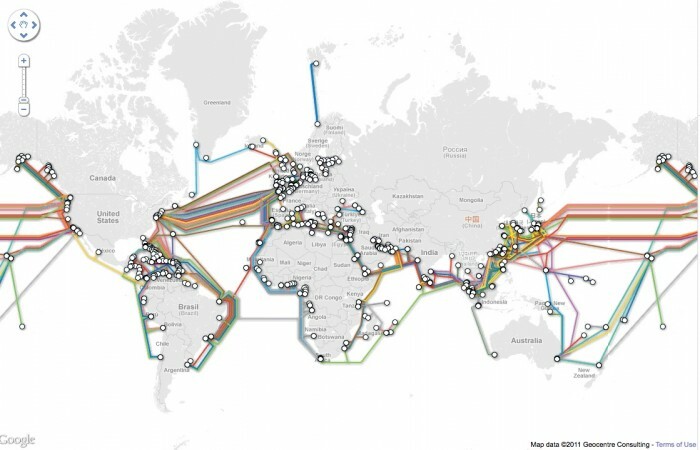 These cables are the links that connect the Internet across oceans and continents, and typically they only get noticed when they go down. For the truly nerdy, this makes awesome wall art, but if you’re more like the rest of the population, it’s a fun resource to turn to the next time a woman panning for copper cuts a cable, you’re looking for a good place to base a data center, or you want to see how interconnected we are. For example, Hillsboro, Ore., should be known as Cabletown given that three cables land there: more than any other city in the U.S. That and other fun facts await you at submarinecablemap.com.